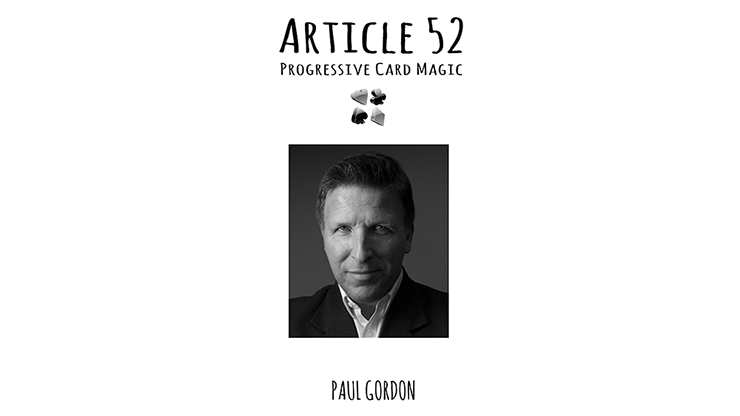 Today, when you order "Article 52 by Paul Gordon - Book", you'll instantly be emailed a Penguin Magic gift certificate. You can spend it on anything you like at Penguin, just like cash. Just complete your order as normal, and within seconds you'll get an email with your gift certificate. Well, I know I said Quidnunc was to be my last book, but I just couldn't help myself! The last two years have been really creative ones for me and the result is Article 52. Excuse immodesty, but it really is chock-full of killers! Article 52 includes my new handling of my Head To Head Poker (from Gold Dust) wherein the spectator FREELY shuffles the cards. But, Article 52 contains nearly 60 NEW tricks. If you liked Gold Dust and Quidnunc, you'll LOVE Article 52. Top-quality saddle-stitched hardback. 144 jam-packed easy-to-read pages. If you know my style of writing you'll know that most tricks are described, clearly, in one or two pages. Enjoy! Article 52 is but another example of the Genius of Paul Gordon. These old hands may not be able to master all of these fun effects but it is sure fun trying. I highly recommend this book and, frankly any of Paul’s downloads, books and DVDs.